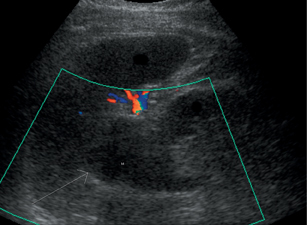 Initial ultrasound examination demonstrated the patient’s known infrarenal abdominal aortic aneurysm and discovered a 3 × 4 cm solid, slightly lobulated, hypoechoic mass contiguous with the upper pole of the left kidney and adjacent to the spleen. It did not contain any calcifications (Figure 1). 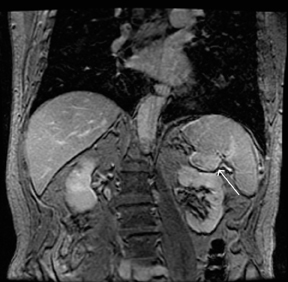 Concern for a renal or adrenal neoplasm prompted further evaluation with computed tomography (CT). 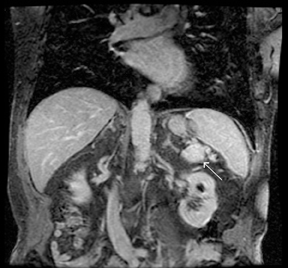 Contrast-enhanced CT of the abdomen and pelvis revealed a 4.3 × 3.9 cm enhancing solid mass superior and anterior to the left kidney with a fat plane separating the mass from the left adrenal and left kidney. The mass surrounded the inferior tip of the spleen without distorting the parenchyma, suggesting containment by the splenic capsule (Figure 2). Abdominal magnetic resonance imaging (MRI) was performed to further characterize the mass. MRI showed an ovoid T1 and T2 intermediate, heterogeneously enhancing exophytic splenic lesion (Figures 3 and 4). The left kidney, left adrenal gland, pancreatic tail, liver, and gall bladder were normal. There was no lymphadenopathy. Chest x-ray demonstrated hyperinflation without pleural plaque, effusion, mass, or infiltrate. Surgical resection with splenectomy and distal pancreatectomy was performed. 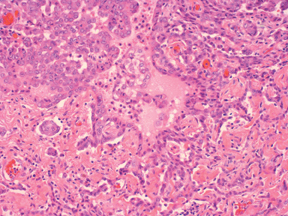 Pathology revealed a tumor arising from the splenic capsule, or possibly from a mesothelial inclusion within a splenic hilar node (Figure 5). The tumor was surrounded by lymphoid appearing cells and portions of a fibrous-like capsule. The splenic parenchyma was uninvolved (Figure 6).There was no splenomegaly. Additional splenic hilar nodes were negative for tumor. The tumor cells stained positive for mesothelial markers calretinin, keratin 5/6, keratin AE1/3, and CAM 5.2. Adenocarcinoma and melanoma markers were negative. The immunohistochemical features were consistent with mesothelioma. The clinical features of peritoneal mesothelioma include abdominal pain, mass, distension, ascites, and thrombocytosis. In contrast to diffuse malignant mesothelioma, localized malignant mesothelioma is most often an incidental finding. 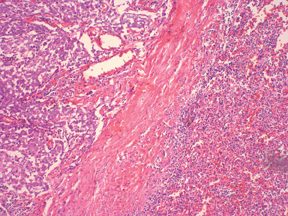 Localized malignant mesothelioma presents as a well circumscribed tumor of the serosal membranes with the microsopic appearance of diffuse malignant mesothelioma. There is no evidence of organ encasement or studding by tumor. Little has been reported about localized malignant mesothelioma. In a series of 23 patients with localized malignant mesothelioma described by Allen TC, et al., 21 (91%) were pleural based, while 2 (9%) were peritoneal.3 The age at mean presentation was 63 years with a male:female ratio of 2:1. Computed tomography and/or MRI of localized splenic malignant mesothelioma has not been reported to our knowledge. This case demonstrates the expected characteristics of a soft tissue tumor; sharply demarcated, heterogeneously enhancing without dystrophic calcifications. No metastatic lesions were found upon initial imaging or at one-year follow up. Adjuvant chemotherapy and radiation therapy were not undertaken. Differential diagnosis of a mass localized to the splenic hilum includes primary and secondary neoplasm as well as infectious etiologies. Respectively, these are angiosarcoma, GI stromal tumor, lymphoma, metastatic adenocarcinoma, and granulomatous disease such as tuberculosis. Imaging findings are not sufficiently distinctive to allow a specific diagnosis. Diagnosis may come at surgery or be possible via percutaneous biopsy if the anatomy is favorable. Localized malignant mesothelioma is histologically, immunohistochemically, and ultrastructurally identical to diffuse malignant mesothelioma. Epithelial-types predominate with the remainder being sarcomatous or mixed. Light microscopy of malignant epithelioid mesothelioma is characterized by sheets of polygonal cells with abundant eosinophilic cytoplasm, round nuclei, and prominent nucleoli.2 All mesotheliomas stain positive for keratin. The best immunohistochemical markers for differentiating epithelial malignant mesotheliomas from papillary serous carcinomas are calretinin, thrombomodulin and keratin 5/6 positivity.2 Calretinin has the highest sensitivity for malignant epitheliod mesothelioma. Negativity for adenocarcinoma markers such as CEA and TTF-1 are important discriminators. The prognosis for localized malignant mesothelioma is favorable compared to diffuse malignant mesothelioma. Cytoreductive surgery and intraperitoneal chemotherapy are treatment options for diffuse malignant mesothelioma, whereas most cases of localized malignant mesothelioma are cured by surgical excision. This case illustrates the presentation of a rare entity, localized splenic malignant mesothelioma. Recognition and differentiation of localized mesothelioma from diffuse malignant mesothelioma is critical, as their treatment options and prognosis are vastly different. Localized malignant mesothelioma is most often an incidental finding at presentation and cured by surgical excision. Winstanley AM, Landon G, Berney D, et al. Immunohistochemical profile of malignant mesotheliomas of the tunica vaginalis: A study of 20 cases. Am J Surg Pathol. 2006;30:1-6. Busch JM, Kruskal JB, Wu B. Best cases from the AFIP malignant meosthelioma. Radiographics. 2002;22:1511-1515. Allen TC, Cagle PT, Churg AM, et al. Localized malignant mesothelioma. Am J Surg Pathol. 2005:866-873. Antman K, Hassan R, Eisner M, et al. Update of malignant mesothelioma. Oncology (Williston Park). 2005;19:1301-9; discussion 1309-1310, 1313-1316. Robinson BWS, Lake RA. Medical progress: Advances in malignant mesothelioma. NEJM. 2005;353;1591-1603. Leigh J, Robinson BWS. The history of mesothelioma in Australia 1945-2001. In: Robinson BWS, Chahinian PA, eds. Mesothelioma. London: Martin Dunitz, 2002:55-110. Yan T, Haveric N, Carmignan CP,et al. 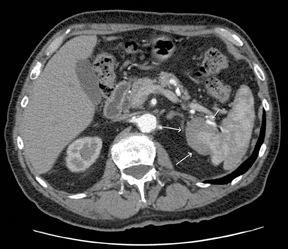 Abdominal computed tomography scans in the selection of patients with malignant mesothelioma for comprehensive treatment with cytoreductive surgery and perioperative intraperitoneal chemotherapy. Cancer. 2005;103:839-849. Localized splenic malignant mesothelioma. Appl Radiol.